26 months (2 years and 2 months) ago, in February 2012, I made an FoI request to Wirral Council, requesting copies of the correspondence that had passed between DLA Piper (Solicitors) and the council during a specific period of external investigator Anna Klonowski’s inquiries. Despite some initial stonewalling, the council have at long last provided some information, but it’s barely adequate. I say this because Monitoring Officer Surjit Tour’s accompanying email refers to “correspondence which the council is prepared to disclose”. i.e. it seems they are OK to go part of the way, but are not prepared to disclose anything which may threaten their positions or the council’s reputation. That’s the way I read it at the moment, and I’ll be appealing once again to the ICO. There are a total of 23 pages of emails in a .pdf file which I’ve attached to the bottom of this post. 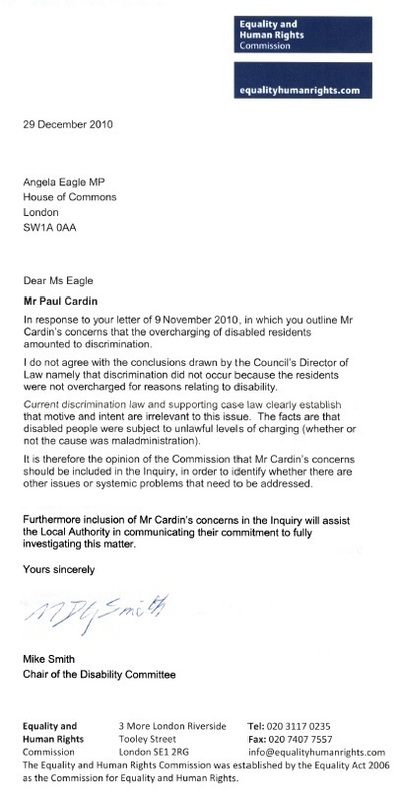 The reason I placed this request was that in 2010, I’d asked Angela Eagle, my MP, to seek an opinion from the Equality & Human Rights Commission on Wirral’s callous and repeated abuse of 16 of their learning disabled tenants over an 8 year period – when a total of £736,756.97 was plundered from theirs and others’ bank accounts unlawfully. 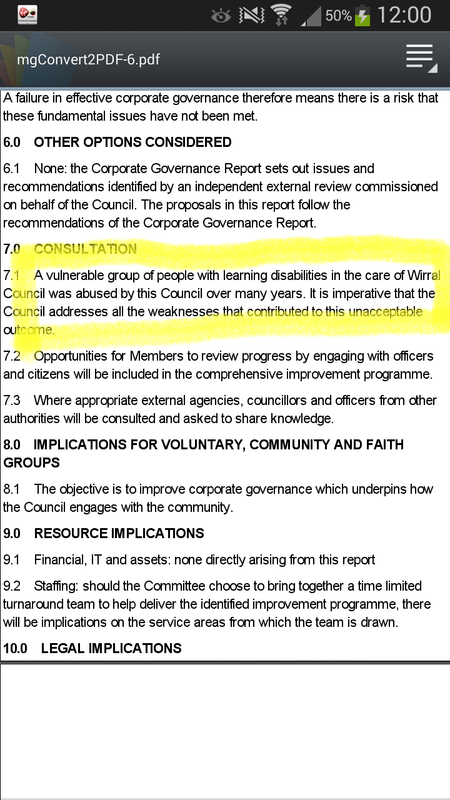 The upshot of this was that Mike Smith, the then Chair of the Disability Committee at the EHRC, found that Wirral had discriminated against disabled people. By December 2012, he’d been forced out of his post by anonymous seniors. But in between Smith arriving at this finding and his subsequent removal, DLA Piper had been commissioned by Klonowski, eventually arriving at the conclusion there’d been “no disability discrimination”. They fed this back to Anna Klonowski and she included it at the end of her report – which, despite the “right to reply” claims, still has many names redacted several years on. 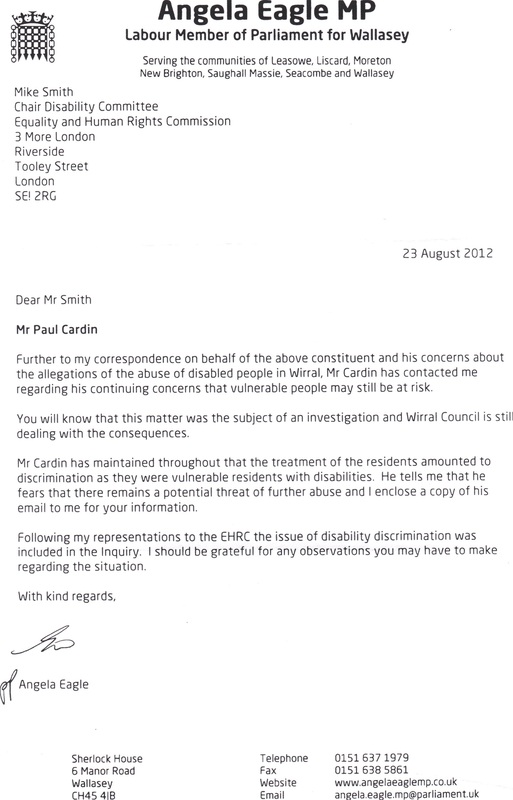 Councillor Simon Mountney very kindly furnished a copy of this letter to the chair of Wirral’s Health & Wellbeing Committee, Councillor Moira McLaughlin, and to all attending members, following this Wirral Globe article, but she pulled the shutters down, wouldn’t allow it to be discussed and didn’t want to know. Much later, there was a follow up letter from Angela Eagle to Mike Smith, asking for any further observations. The whole process has felt like one long painful and calculated stitch up. 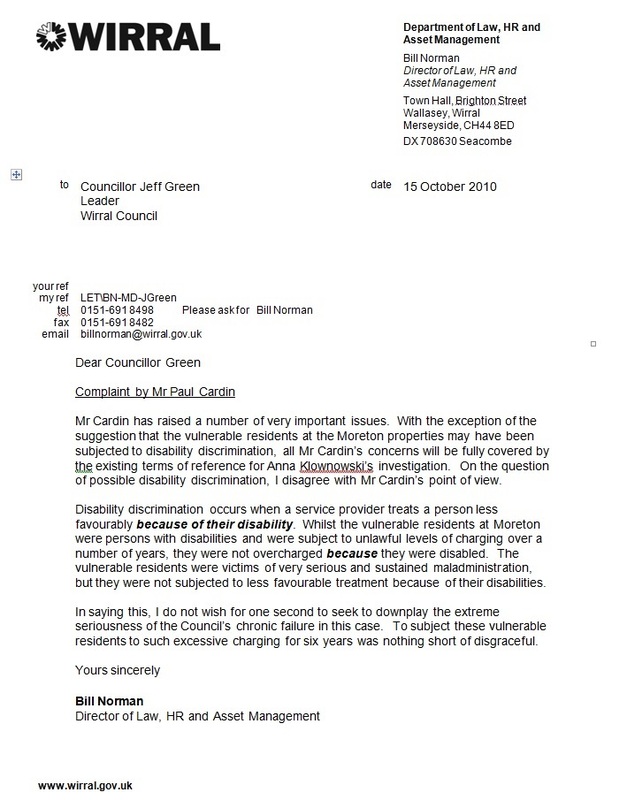 Norman got one thing right in his letter though, the abuse of disabled people was nothing short of disgraceful, but the targeted bullying, mobbing and forcing out of whistleblower Martin Morton after he’d clearly acted in the public interest by reporting this unlawful activity was callous, deeply cruel, and beyond disgraceful. He remains unemployed / unemployable to this day. It would seem that Surjit Tour has been extremely selective in which emails have been attached in the PDF file & yet again the old redact black marker has been at it again. The emails say nothing other than the fact that the council through their officer want to sweep this disgraceful story under the newly installed very expensive carpet. Cheers John. Thanks for your comment – always welcome. More bad news I’m afraid……. I’ve just spotted a howler I made on this. We can add a whole YEAR onto the time taken to address it. It’s actually 26 months old, during which time they’ve been stonewalling better than Peter Tatchell himself, but with far less justification. Even now, right at the death, such is their fanatical devotion to the cause of distraction and minimisation, they’re scattering a few crumbs where there should be tables groaning with fat steaming loaves. This my friend is intransigence du jour, brought to us by renowned masters of the Art.